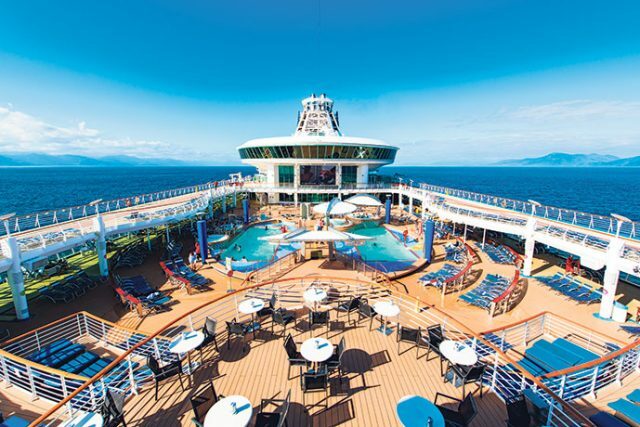 As a first time cruiser, I have to admit I didn’t quite know what to expect when boarding Royal Caribbean’s enormous Explorer of the Seas for a 10-day South Pacific adventure. Every cruise is made up of first-timers like myself, those who’ve hit the seas a few times and of course cruise veterans who know everything from how to score the best deck chair to where the sea sick tablets are (which, I have to admit, I needed to know myself on the third day of our cruise). No matter what your cruising experience, eventually everyone is on the same level – and what an adventure it is. Recently renovated, Explorer of the Seas is quite a sight – and it’s often easy to forget you’re on a cruise ship, especially when you’re walking along the stunning main promenade. Despite the huge number of people on board, nothing ever felt over-crowded, even the main deck area which is obviously where people tend to gravitate as the day unfolds. The adults-only pool area offers a good escape from the excitement and activity of the main deck, and was never too busy especially if you scored yourself a deck chair early in the day. Our stateroom – a spacious room with a balcony – was just as good as any hotel room you’d find on a trip. Many say that the room matters little as you’re rarely in it, but it’s always nice to have a comfortable ‘home base’. 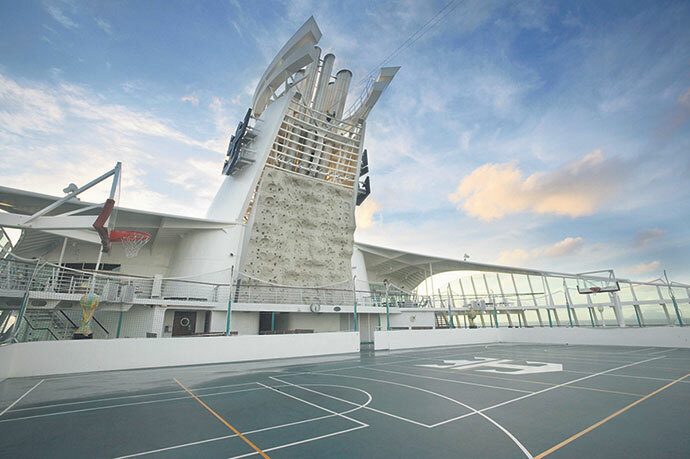 Here’s the great thing about cruising: you can do as little or as much as you like. There are some days where a few cocktails on a deck chair on the main deck, or a lazy visit to the spa – which I might add had probably the best hot stone massage you could ever imagine – will do just fine to fill in the hours. But if you’re feeling active, the list of things to do is literally endless – from simple quizzes and trivia games, through to bellyflop competitions, zumba, karaoke and film screenings. Regardless of your age, you’ll find something to do (and conveniently, the daily ‘Cruise Compass’ delivered to your room will ensure you don’t miss a thing). For something a little unique, try a game of mini-golf or the rock climbing wall – a special experience especially given the surroundings! There’s plenty of entertainment options in the main theatre as well, and don’t miss the ice show – quite special given the challenges of ice skating at sea. Word is Explorer of the Seas is the only cruise ship with a full ice skating rink on board, so this is definitely one of the ship’s more unique and special experiences. 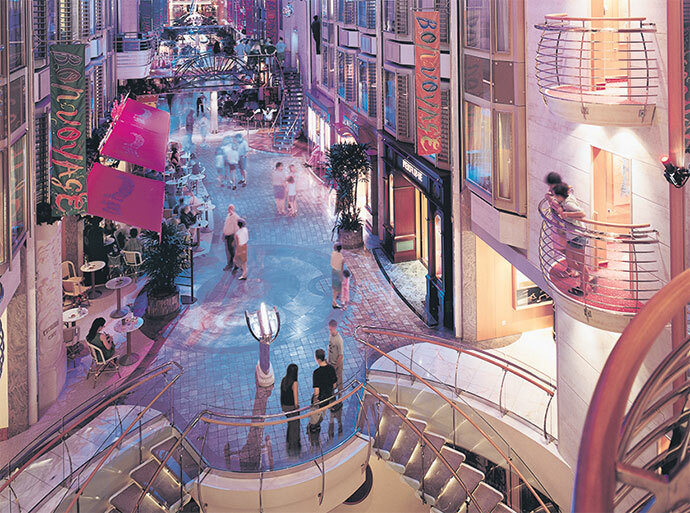 Explorer of the Seas offers a range of dining options. Included in your cruise package is the Sapphire Dining Room, which offers a stress-free sit-down dining experience, and the Windjammer, probably the biggest and best buffet you’ll ever experience. The theme changes daily, so you’ll never really get sick of what’s on offer. We found ourselves at the Windjammer pretty much daily. While the Sapphire Dining Room should be tried at least a couple of times to ensure you get that traditional main dining room experience, the buffet without question offered better quality and options. Explorer of the Seas also has specialty dining options, which are very reasonably priced and can offer a good break from the main dining offerings. The Japanese restaurant, Izumi, was the pick of the bunch – fresh, delicious and beautifully prepared. Chops Grille, a steak restaurant, offered an elegant and tasty meal, while Johnny Rockets is a great lunch option, especially when you consider it’s $9.95 per person and you can have whatever you want from the menu – and as much of it as you want, too. As for drinks, options are endless but your big decision will be whether or not you purchase an unlimited drinks package (which means you can drink beer, wine, spirits, cocktails and soft drinks until your heart’s content). It’s a little pricey, and keep in mind that every adult in your stateroom has to purchase the package. If you think you’ll have more than four or five drinks a day, it’s definitely worth it – and you won’t need to feel any guilt when heading back to the bar for a Pina Colada! Royal Caribbean’s 10-day South Pacific cruise took in Noumea, Lifou (Loyalty Islands), Vanuatu and Isle of Pines, the latter of which being a real highlight (perhaps the most amazing water you’ll ever swim in). Keep in mind that you don’t need to book a shore excursion to experience each destination, you can simply walk around the beaches or head into town yourself, but the excursions are a great way to learn a little more about the location in question. While in Lifou we undertook the ‘Forest and Secret Grotto’ excursion, which was a real highlight of the trip – experiencing a tiny village, learning about local customs and wildlife, and meeting a few extraordinary characters along the way. A couple of tips: Bring your own snorkelling gear and swim shoes. It’s not hard to see why people return to cruising holidays time and time again. It’s essentially two holidays in one – the ship itself is akin to residing in a resort for a week or so, while the destinations are equally amazing. Once on board, choosing not to spend anything more doesn’t mean you miss out on all that much, though it’s probably advisable to board with at least a small budget in mind. Without question, Royal Caribbean offers a world class experience – and those South Pacific islands ain’t bad either. For details on upcoming cruises on Explorer of the Seas, visit www.royalcaribbean.com.au. Troy Dodds travelled as a guest of Royal Caribbean.